The total commitment of money has not been disclosed. But a document by the eurozone leaders noted that experts had estimated that Greece might need from 82 billion to 86 billion euros more — $91 billion to $96 billion — to shore up its economy, rebuild its banks and meet its debt obligations over the next three years. The document said Greece and its creditors should seek to “reduce that financing envelope,” if possible. 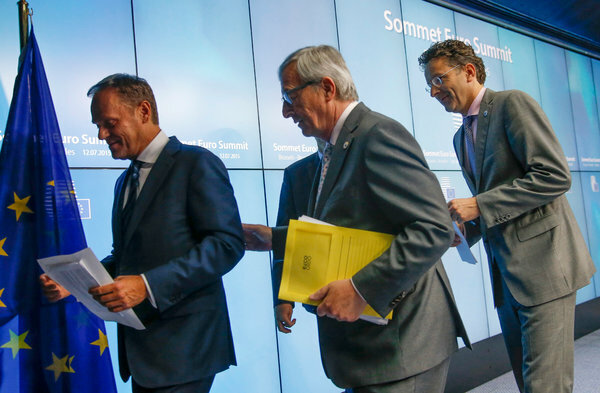 Mr. Tusk later used his Twitter account to write that steps would be pursued “to swiftly take forward the negotiations” on the latest bailout.